Nice, leisurely day getting up late to help alleviate any residual jet lag. 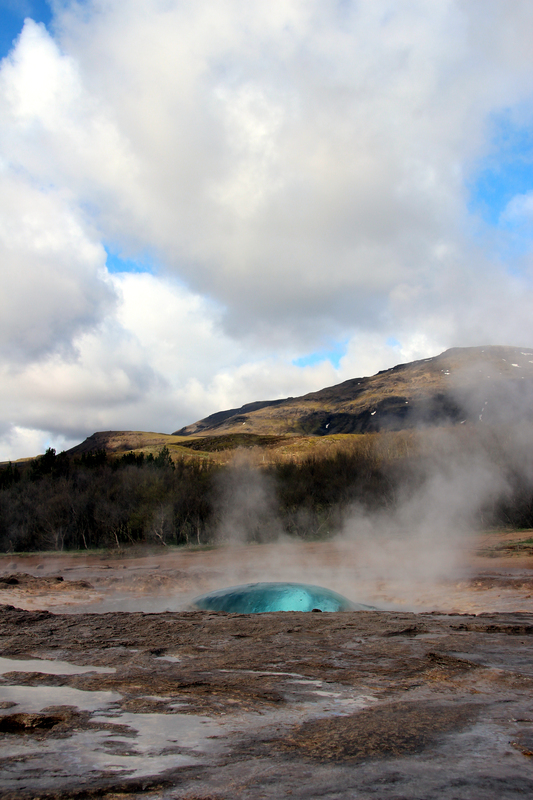 Today, we visited two of Iceland’s most popular attractions: Geysir and Gullfoss Falls. Both of these were just a few minutes drive time from our apartment hotel in Laugarvatn, which left us additional time just to drive around and check out the scenery. 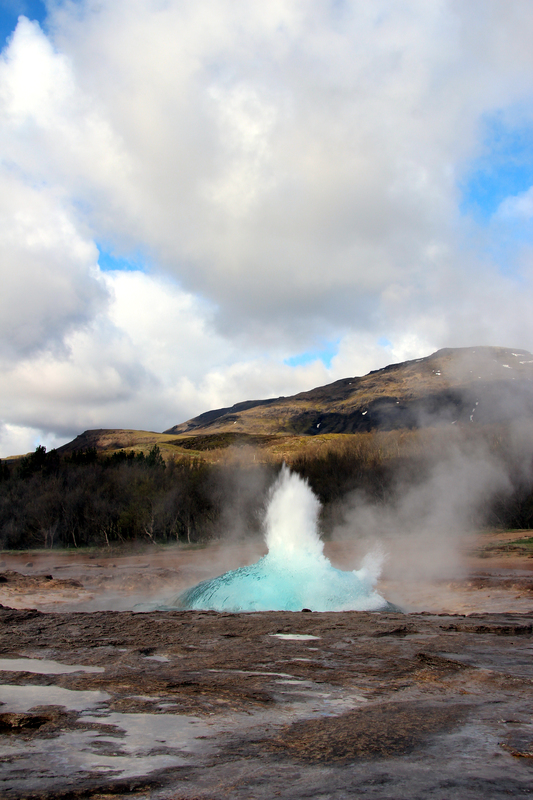 Geysir (pronounced “gay_seer”) is Iceland’s version of old faithful. Unfortunately, Geysir itself is no longer faithful since some dumb tourist tossed some rocks in the hole causing the geyser eruption, according to a sign in the park, to be limited to those times during earthquakes. 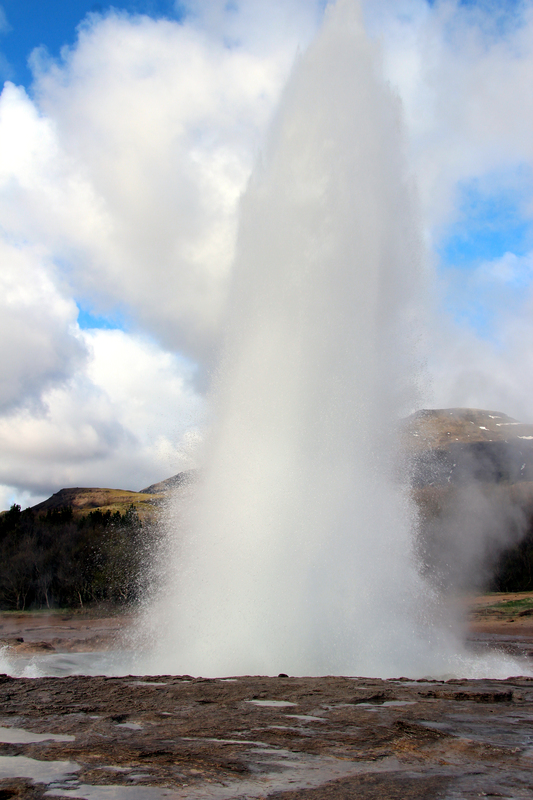 Fortunately, right next door is the Strokkur geyser which erupts with excellent regularity every 8-10 minutes. We enjoyed hanging out by this geyser getting different photo and video angles during each blast. 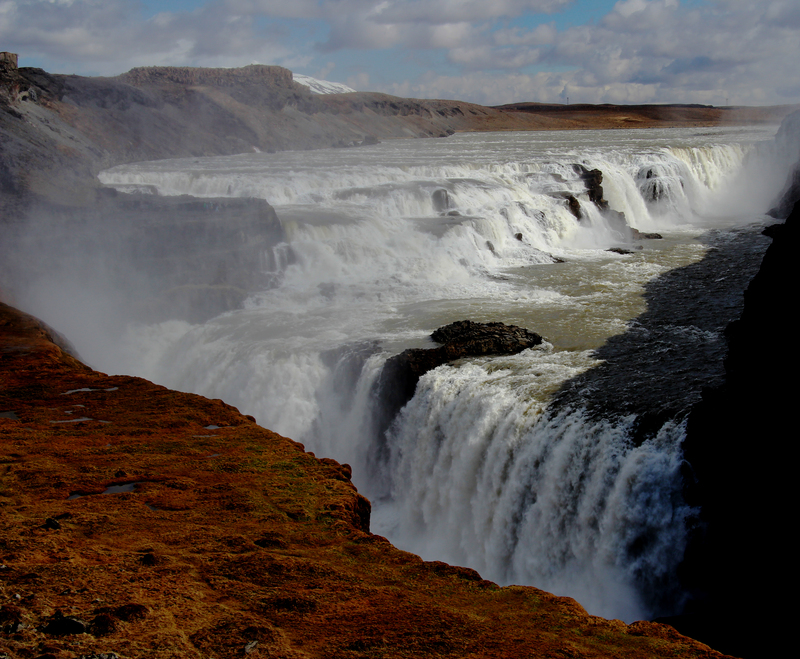 Our next stop of the morning was the awesome Gulfoss waterfalls. The falls are in a two-step pattern: The upper portion plunges gently through a wide opening; the lower section drops sharply into a narrow ravine. The sound from the combination of these two forces is deafening. There’s a trail that takes you down to the transition between the two sets of falls; the upper trail goes along the top of the cliff above the entire falls giving you a great view across and down the river. After taking copious numbers of pictures and videos of Gulfoss, we had some time to kill the rest of the afternoon, so we decided to explore the sights on a lonely road that went deep into the heart of the Icelandic interior. Along the way we found another spectacular waterfall, as well as a re-recreation of an Icelandic village that had been destroyed in a volcanic eruption in the 1,100’s. The road took us along a broad river valley where the country had built a large hydroelectric dam. We thought it odd that in the same area where this massive hydroelectric power generation system was installed, they also put up two wind turbines also used for generating electricity. Why would you put in this massive hydro system, then add a couple of little wind turbines? We were confused. Anyway, through occasional breaks in the clouds, we got a glimpse of the mighty Hekla volcano off in the distance. If all goes well, in two days we would be riding a snow cat to the top of this magnificent mountain. On the way back to Lauvargatn, we made another slight detour to visit an old church that has a small museum in its basement. This tiny museum had artifacts from previous churches dating back hundreds of years. The center attraction was a large rock coffin used to bury a bishop. Also in the museum were some tombstones with unique carvings. The little museum was good for about 15 minutes, and that was pretty much it. 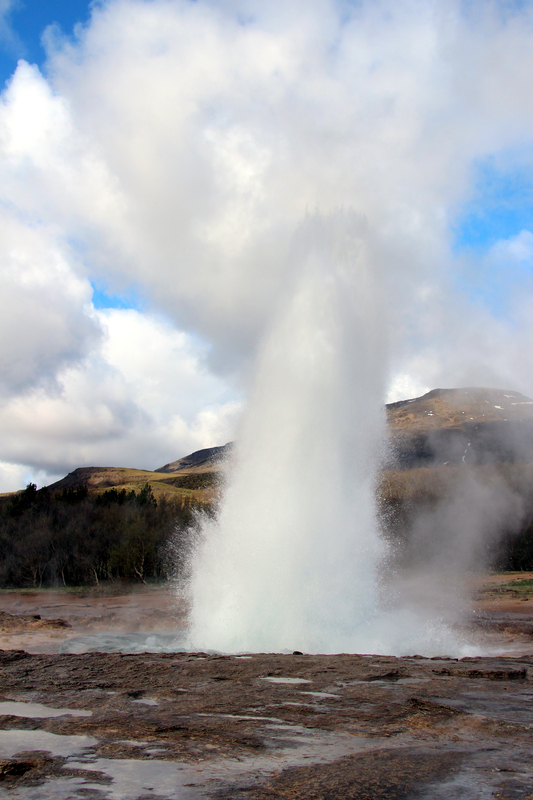 This entry was posted in International Travel and tagged geyser, geysir, gulfoss, iceland, waterfalls. Bookmark the permalink.